Ever since the adoption of the 2030 Agenda for Sustainable Development and the Paris Agreement, a growing range of solutions-oriented initiatives have sought to provide support to youth-led innovations in business, charity, and education. These initiatives, which include the Youth Solutions Report platform of SDSN Youth, simultaneously seek to mobilize youth skills in support of global problem-solving and address the obstacles young people face in creating and scaling-up their projects. Two years removed from those historic milestones, the need to harness the skills and enthusiasm of younger generations for sustainable development appears to have been firmly established as a key issue for the international community. Many actors now recognize the meaningful involvement of young people is not simply a slogan or a goal in itself, but rather an enabler of sustainability transitions across the wide spectrum of challenges facing our economies and societies. What is important, then, is to understand what is preventing youth-led innovations to reach their full potential, as well as to create effective ecosystems of support for their proponents. This is why, on 9 November 2017, SDSN Youth co-hosted an official side-event titled “Supporting Youth-Led Innovation to Confront Climate Change: Opportunities for Action”, at the 23rd Conference of the Parties to the UN Framework Convention on Climate Change in Bonn, Germany. 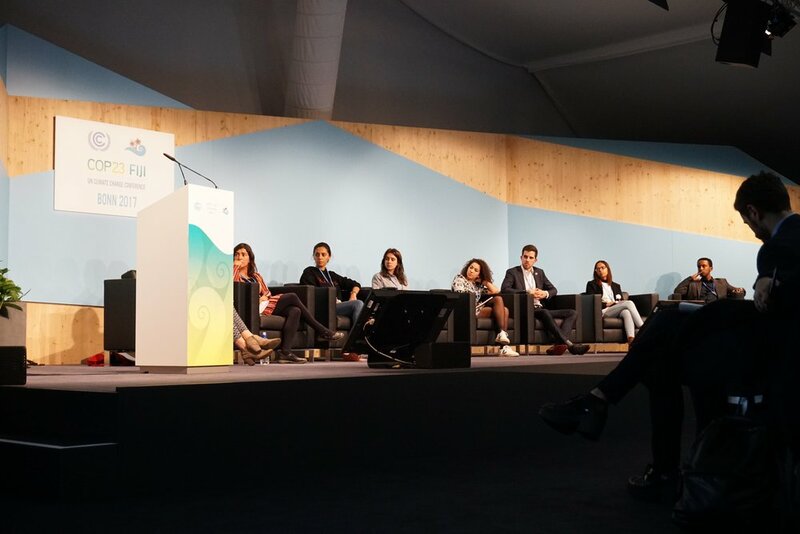 The event, which was co-organized with partner organizations CliMates, Student Energy and Convergences, sought to bring together innovators and those public and private stakeholders whose support is essential for youth skills to be harnessed in support of sustainable development, including governments, international organizations, investors, and financing mechanisms. The discussion was structured around two core sessions, a panel and a dialogue. The panel featured eight young innovators on climate change and energy coming from different countries and sectors, who briefly introduced their areas of work and listed the key challenges they face in securing funding, having access to mentoring opportunities, connecting with partners, and enhancing their visibility. Participants included three represenatives of projects included in the 1st edtion of the Youth Solutions Report: Luca Bucken, Director of partnerships for the social-enterprise Liter of Light; Abiy Shimelis, Founder of the start-up Addis Sustainable Life and Partnerships Manager for the Climate Smart Agriculture Youth Network; and Josephine Raynauld, coordinator for CliMates of the COP in My City project. The other five speakers in the panel were Evelyn Araripe (Team Member of the Youth Climate Leaders project); Wafa Hmadi (Coordinator of the A3C project for RAJ Tunisie); Dominique Souris, Co-Founder and CEO of the Youth Climate Lab); Pramisha Thapaliya (Delegate of the Youth Ag-Summit 2017); and Lise Tanfin (the French Government’s Youth Delegate at the UNFCCC). The experiences of the eight innovators ranged from training local communities in developing countries in the production of solar lights to climate change adaptation, circular economy, climate smart agriculture, and climate education. All their stories, however, pointed to common challenges that the lack of specific innovation systems for young people exacerbates, such as the difficulty of applying for funding at multilateral financing institutions, the lack of meaningful involvement into national and local mitigation and adaptation plans, and the insufficient presence of capacity-building and skills-development programs in many countries. Should youth-led innovation on energy and climate receive specific attention from governments, international organizatons and investors, as opposed to innovation in general? Where can each actor contribute the most to youth-led innovation on energy and climate? All contributions acknowledged the need to bridge important gaps which prevents young innovators, on the one hand, and public and private actors, on the other, from partnering more effectively on climate and energy. Recognizing that innovation can come in many forms, from technological breakthroughs to instances of social innovation, to new policy proposals, the experts suggested that it is necessary for the different stakeholders to co-operate in the creation of ecosystems of support that do not neglect certain types of innovation in favor of others (for example, focusing on technical projects which appeal to investors whilst dismissing adaptation projects that can yield great benefits in local communities). In addition, they emphasized that communication is always critical, because in many cases public and private actors at the highest level are simply not aware of the innovation and problem-solving which takes place on the ground, and young people should thus be increasingly vocal in pitching their solutions to potential funders and supporters. Third, they higlighted the need to avoid the unnecessary duplication of support initiatives, such as acceleration programs or dissemination platforms, in order to increase impact and efficiency. Finally, they underlined that training young innovators in impact assessment and entrepreneurship is often the best means to ensure that brilliant projects can be implemented through sustainable growth strategies and communicated with more credibility to investors and supporters. As the outcome of COP23 reinforces the urgency of ramping up climate ambitions across all sectors of society beyond governments, this side-event provided a timely reminder that a multi-stakeholder partnership focused on supporting youth-led innovation is likely to be a critical determinant of the world’s success in tackling climate change through the skills and vision of younger generations.